The Ancient Box Trap is a Forgotten type weapon. The ancient ghost mice which roamed Gnawnia before even the castle existed require an old-fashioned trap strategy, and the Ancient Box Trap is about as old-fashioned as they come. 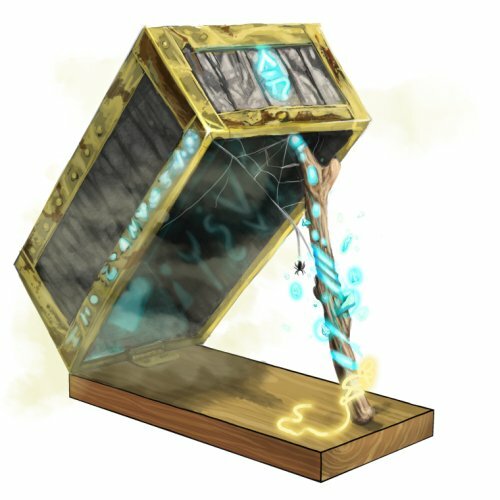 A heavy stone box teeters precariously upon an Ancient Relic Staff, waiting for a mouse to pull the Ethereal Rope and cause the box to slam shut and magically fuse with the base. This may seem like a deceptively simple trap set-up, but ancient mice enjoy the classics. The Ancient Box Trap is not sold by any Trapsmith. It can only be crafted using the proper components. 2 September 2009: Before this date, a minimum of 19,000,000 points was required to craft the Ancient Box Trap. The point requirement was lowered to make the trap accessible to most hunters with the title of Knight. "A trap design that has long withstood the test of time. The parts of this trap emit a powerful glow capable of mesmerizing power-hungry, greedy mice. The heavy stone box teeters precariously upon the Ancient Relic Staff awaiting a mouse to pull the Ethereal Rope and cause the box to slam shut and magically fuse with the base. It is only this simple, long-forgotten trap that is capable of defeating the powerful Acolyte mouse." 29 July 2015: The point requirement for the Ancient Box Trap was lowered from 17,000,000 to 13,500,000. You are attempting to craft a trap component that you do not meet the points requirement for. You require 13,500,000 points to craft this component.